After a whirlwind 72 hours at home, I'm off to Bangkok for the Thailand Travel and Dive Expo, where I'll be giving talks about humpback whales and sperm whales. My talks are at 17:00 on Saturday and Sunday, 14-15 May, for 45 minutes each day. 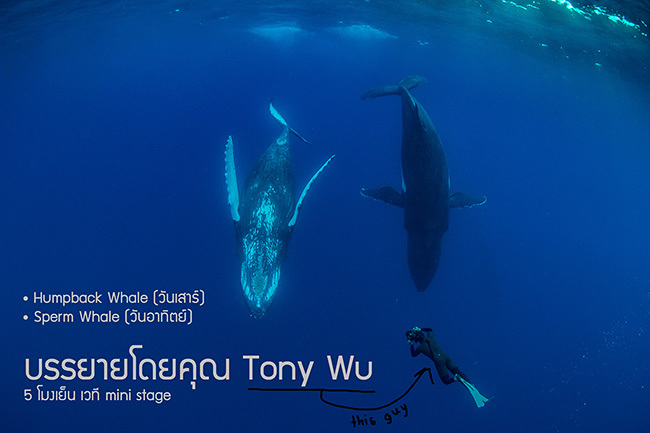 The first presentation on 14 May will be about humpbacks; the second on 15 May about sperm whales. The two talks are structured as two halves of a single presentation, so if you want to get the most out of what I'm saying (or possibly be 2x as confused), you'll need to see and listen to me twice. It's been several years since I've attended TDEX, so I'm looking forward to seeing friends, and...of course...to pigging out on Thai food. Life doesn't get much better.